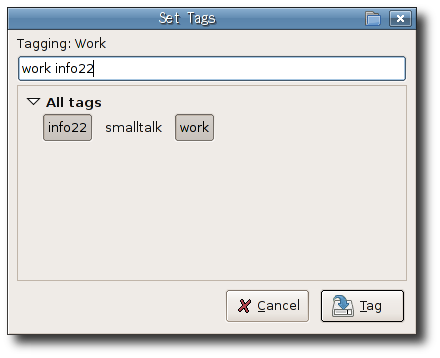 last-exit is a gtk implementation of the Last.fm (‘social’ music streaming, gotta hate these web 2.0 buzzwords) client. Needless to say it rocks. Hard. Last exit player window. with play/pause button, like/dislike, Tag this song, Journal this song, the song metadata, and a save button which does the saving voodoo. Please note that 0.2 version might not work with recent gstreamers for unclear reasons, the bug has been filed in bugzilla. # Modifying a tuple ? Compare "python mod1.py" and "python mod2.py"
Of course these snippets are a bit convoluted, but I often find these patterns appearing randomly..
How much of them have you got right without looking at the answer before? Stock trading is fun.. well, when you make money of course. 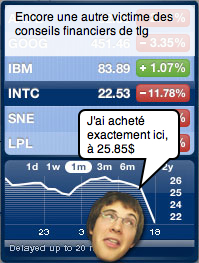 There are days when you wish you didn’t buy that crappy stock, today it’s intel. 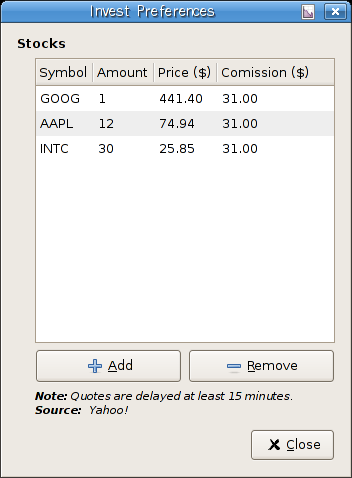 This leads me to the introduction of Invest, a replacement/companion for gtik, the stock ticker currently in gnome applets. 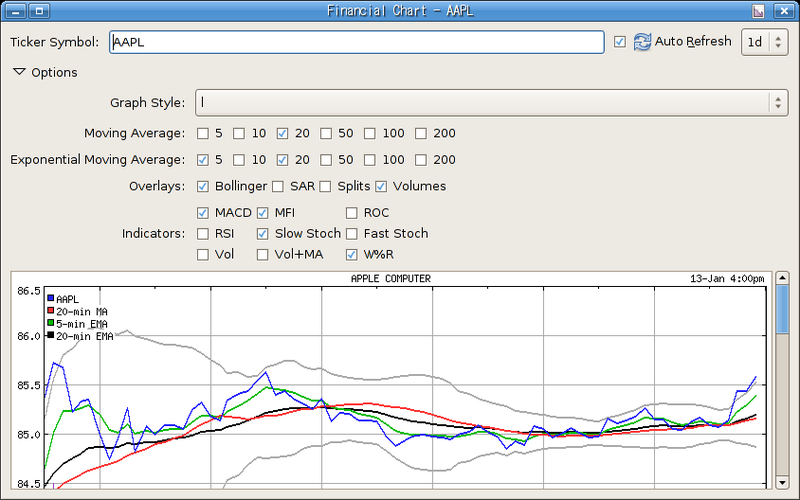 It allows one to create a portfolio, and track its progress in terms of gain/losses. 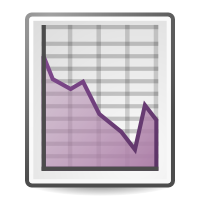 It also features a yahoo graph viewer, with the options found on their website, very nerdy ! The portfolio editor, note the particularly bad taste of mine.. This is the first release, nothing official yet, but i know there are people who like these things. I have discussed with Christopher Aillon and he gave me really nice ideas for future developpment. Download the invest-applet-0.1.0.tar.gz tarball ! I welcome any patch/comment/suggestions. The future applet will have a color indicator instead of numbers in the pane, to take les space and be less anti-private, in case someone is looking over your shoulder. 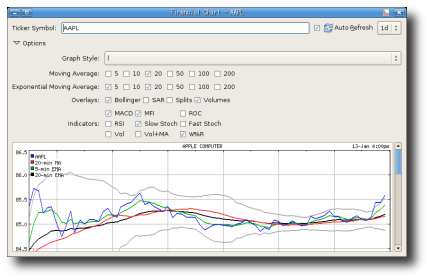 Further improvements also include gconf usage and maybe general applet polishing. 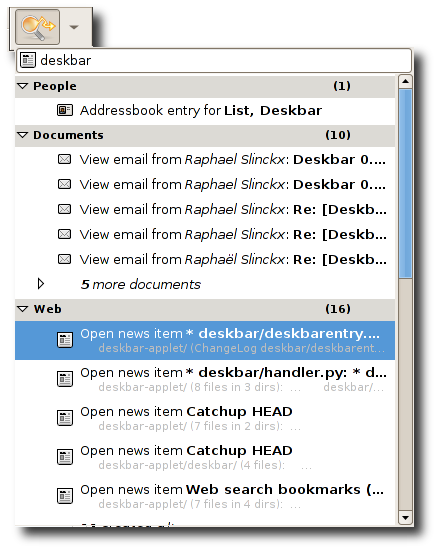 Recently Nigel Tao posted on desktop-devel the announce of deskbar-applet, which was intended as a browser-like keyword-driven url bar. You type a web address, or an email address, or a file name, or some keyword then the arguments, an it shows a popup with possible choices from there, like “Search google for foo”. See this screencast to see the original idea. 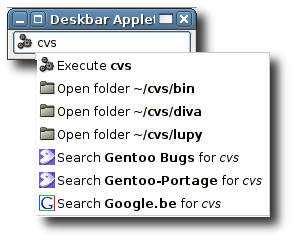 I offered to help and we moved the code to gnome CVS under the “deskbar-applet” cvs module, see instructions at the end of the post to get and try it. 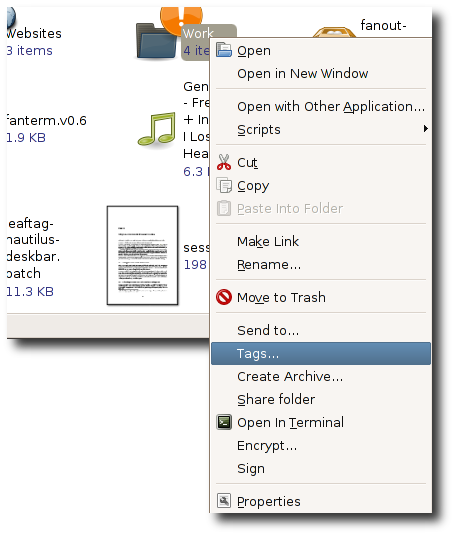 Type a filename in your home dir, like ~/Report.pdf or foo/bar.txt, and you can open that file with the associated applications. Also works with directories. Type an email address or website name, and you can write a new mail, or surf the website with associated apps. 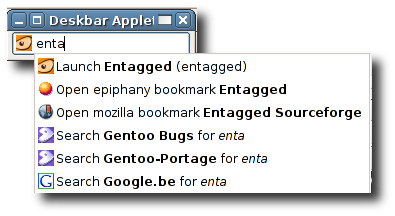 Terms are also matched against mozilla/firefox/epiphany bookmarks, so if you have a bookmark for Entagged Website, typing entagged will offer you to launch the browser to that address. 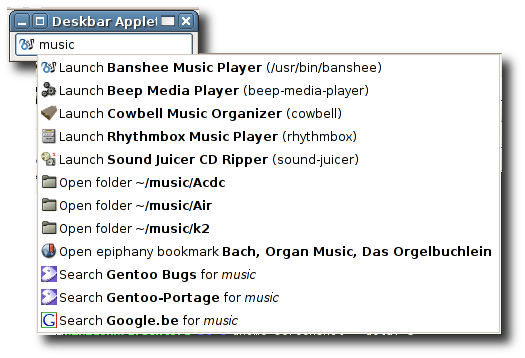 deskbar-applet will also use your smart bookmarks wisely. 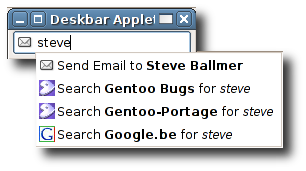 type a search term (“steve” for example), you are then presented a list of smart bookmarks to use with the entered term. 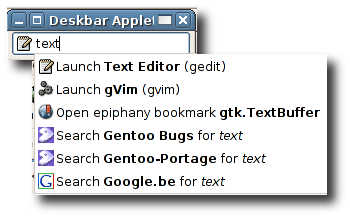 I have a Gnome Bugs bookmark in epiphany, that i use with bug numbers, i can enter a number in deskbar-applet and select the “Search Gnome Bugs for 10000” entry and be there. Same with google for example. 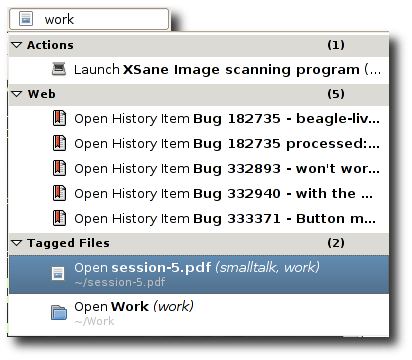 This stuff will soon work with firefox, allowing to use its search engines. 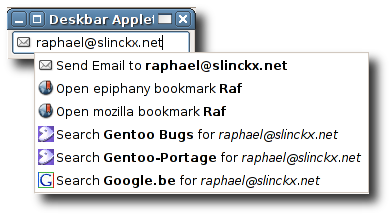 Use galago python bindings (which are coming, according to ChipX86) to autocomplete emails by name and addresses, and also integrate with gaim contacts, allowing to send IM’s by typing the name. We would really appreciate any contribution: ideas or backends, core code, etc. Also worth mentioning is the fact that the startup isn’t threaded and takes some time because it must index all the interesting files each time. This has to be improved of course. I updated the tarball a couple of hours ago wwith an updated version which fixes lots of small bugs, like missing file existance checks and data sanity, redownload if you got an old version. Grab the 0.5 tarball here. For gentoo users there is an ebuild in BreakMyGentoo. 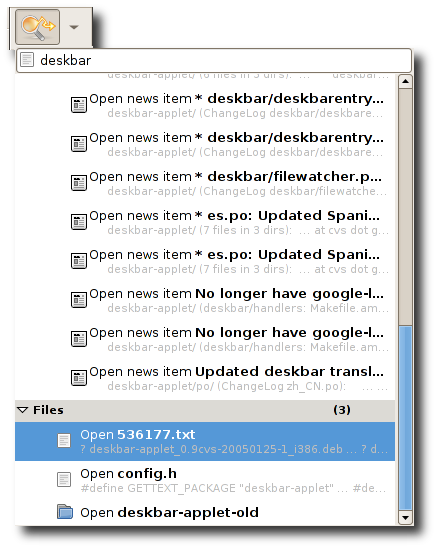 You can also test it uninstalled by running the ./deskbar/deskbar-applet -w in the source directory, this will create the search bar in a standalone window. I heavily used the nautilus-python, and epiphany source code to see how this is done, thanks to them ! 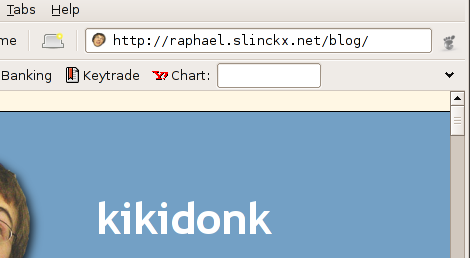 Notice how the window title has been updated by the command in the console. The clever reader may also recognize the same python console as used in epiphany, simply because i just stole all it’s code, thanks Adam Hooper ! 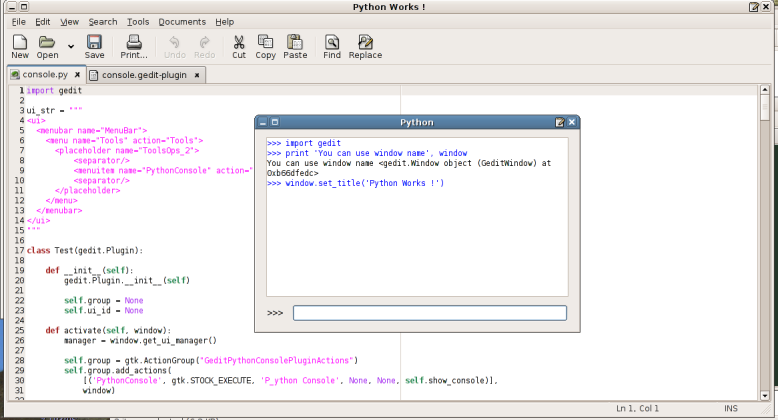 Description=A Python Console inside gedit. You must specify the langage type, so gedit knows which loader to use, and use Module to give the module name of your plugin, generally the filename without the .py extension, but it can also be a directory containing __init__.py !